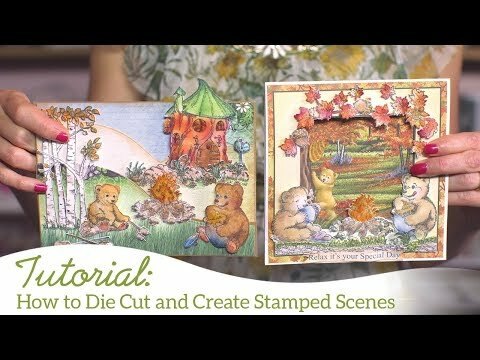 Watch this video here for tips on how to create scenes from the Beary Retreat Collection. Instructions: Construct 5” x 7” Layered Oval Card (Kraft), and cut the Beary Paper Collection for each side of the pages of the album. With a pencil mark the oval that needs to be cut on each paper and choose the coordinating die from the Eyelet Oval and Basics Large Dies and die cut. Sponge edges with coordinating inks and adhere to pages. Stamp Beary Fun Retreat Set on the watercolor paper and die cut them with the coordinating die. Color them with Zig Clean Color Real Brush. Stamp Sunflower Accents on the white cardstock with black and plum archival ink and cut them with the coordinating die and color them with Distress Ink-Peeled Paint, Spiced Marmalade, and sprinkle Crystal Clear with Glossy Accents. Cute mailbox stamp is from Happy Time Treehouse set and die cut with coordinating die. Color it with Zig Real Brush. Die cut one Delicate Border Basics from white cardstock and paste it on the left side of the card. Arrange all the elements as shown on the picture and add the sentiment fussy cut from the paper collection. Now embellish all the pages as you desire.